The Canadian province of Ontario has a tremendous width east to west, including the entire Canadian side of the Great Lakes. Across this vast area there were once about 250 lighthouses. More than 130 remain, a large percentage of them active. 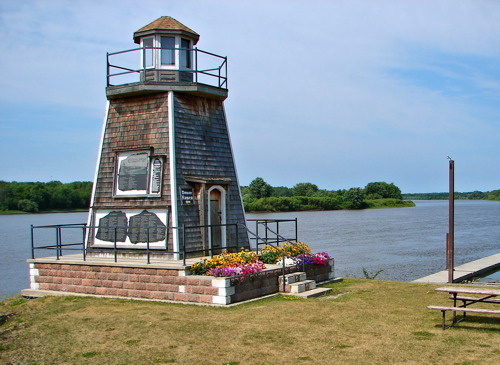 This page includes lighthouses in the western part of the province, guiding vessels on the St. Marys River, Lake Superior, the Rainy River, and the Lake of the Woods. Aids to navigation in Canada are maintained by the Canadian Coast Guard. In 2008, Parliament passed the Heritage Lighthouse Protection Act to designate and protect historic lighthouses. In 2010, the Coast Guard declared the great majority of lighthouses to be surplus, and there is fear that this may lead to the disposal and possible destruction of many lighthouses. This fear is particularly acute in more remote areas, where the lighthouses do not enjoy the support of local preservation groups. Fortunately, Canadian Lighthouses of Lake Superior has been organized to support and restore the lighthouses of that region. ARLHS numbers are from the ARLHS World List of Lights. CCG numbers are from the Inland Waters volume of the List of Lights, Buoys, and Fog Signals of Fisheries and Oceans Canada. For lights near the international border, USCG numbers are from volume 7 of the U.S. Coast Guard Light List. Photos posted by C.W. Bash. Excellent photos plus historical and visitor information from Kraig Anderson's LighthouseFriends.com web site. 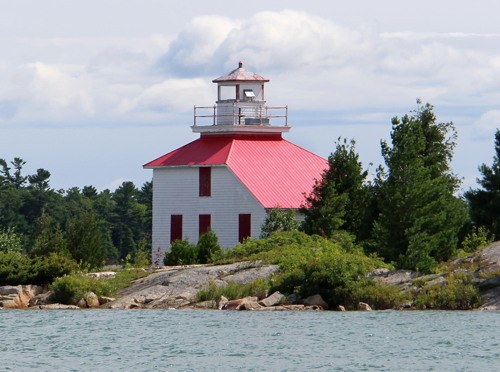 This site, maintained by Neil Schultheiss, has excellent photos and brief but informative accounts for many of the lighthouses on both the Canadian and U.S. sides of the Lakes. Official Canadian light lists are available in both pdf and html formats. Navigation chart information for Lake Superior. U.S. nautical charts for the regions along the border can be viewed online. Note: The North Channel separates Manitoulin Island from the mainland and provides a passage from Georgian Bay on the east to the St. Marys River on the west. 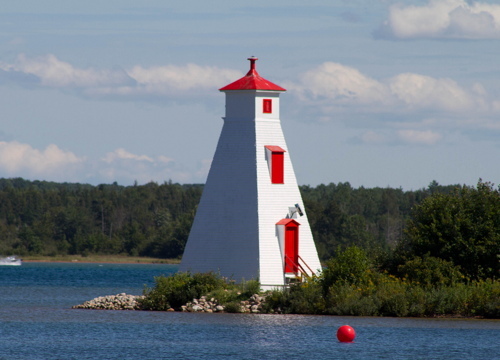 Lighthouses on the south side of the channel are described on the West Central Ontario page. Date unknown (station established 1885). Active; focal plane 15 m (49 ft); white flash every 4 s. 10 m (33 ft) square skeletal tower carrying a square daymark colored with red and white horizontal bands. No photo available, but Bing has a satellite view. The original lighthouse, a square wood tower, was demolished in the 1950s. Located on a small island on the north side of the channel south of Spanish. Accessible only by boat. Site open, tower closed. ARLHS CAN-057; CCG 1020. Date unknown (station established 1884). Active; focal plane 21 m (62 ft); white flash every 4 s. 21 m (62 ft) square skeletal tower, height unknown, carrying a daymark colored with red and white horizontal bands. No photo available, but Bing has an indistinct satellite view. The original lighthouse, a square wood tower attached to a keeper's house, burned to the ground in 1948. Located on an island on the north side of the channel south of Blind River. Accessible only by boat. Site open, tower closed. ARLHS CAN-321; CCG 1033. Date unknown (station established 1869). Active; focal plane 18 m (59 ft); white flash every 4 s. 12 m (39 ft) square skeletal tower carrying a daymark colored with red and white horizontal bands. An older photo is available (showing the daymark colored black and white), but Google has a satellite view. The original lighthouse, a square wood tower, was apparently removed in 1968. Located on an island on the south side of the channel opposite Thessalon and off the north coast of Drummond Island (in the U.S.). Accessible only by boat. Site open, tower closed. ARLHS CAN-484; CCG 1038. Date unknown (station established 1870). Active; focal plane 9 m (30 ft); white flash every 4 s. 6 m (20 ft) square skeletal mast carrying a daymark colored with red and white horizontal bands. No photo available, but Google has a satellite view. The original lighthouse had a lantern atop a 2-story square keeper's house; foundation ruins of the house are seen in the satellite view. Located at the tip of a sharp point projecting into the North Channel at Thessalon. Site status unknown (access appears to be through private property). ARLHS CAN-499; CCG 1049.4. Note: The St. Joseph Channel separates St. Joseph Island from the mainland and carries part of the outflow of the St. Marys River, which drains Lake Superior into Lake Huron. The channel is wide on the east, where it connects to the North Channel, but it narrows to the west, where it is crossed by the ON 548 bridge near Port Findlay. 1907. Inactive since 1975. Approx. 12 m (40 ft) square cylindrical wood tower with lantern and gallery mounted on the roof of 2-story square wood keeper's house. Lighthouse painted white; lantern roof is red. Bash's photo is at right, and Google has a satellite view. By the time it was deactivated, the lighthouse was severely deteriorated. Harold Peterson, who owned the rest of the island, purchased the building and restored it. Still owned by the Peterson family, the lighthouse is now available year-round for vacation rental. Located on an island off Bruce Mines on the north side of the channel. The island is accessible by bridges from the mainland via French Island. Site open, lighthouse open only to paying guests. Owner: Canadian Coast Guard. Site manager: Bruce Bay Cottages and Lighthouse. ARLHS CAN-311. 1975. Active; focal plane 13 m (45 ft); white light, 2 s on, 2 s off. 10 m (30 ft) square skeletal tower carrying a rectangular daymark colored with red and white horizontal bands. Anderson has a photo. Located in front of the historic lighthouse. Site open, tower closed. CCG 1050. 1885 (relocated here in 1905). Active; focal plane 11.5 m (38 ft); white flash every 4 s. 9 m (29 ft) hexagonal wood tower with lantern and gallery, painted white; lantern is red. Dan Ableson has a March 2018 photo (he biked across the ice to the island), Nicholas Fraser has a photo, and Google has a satellite view. This lighthouse was originally built on North Sister Rock and was relocated in 1905. Located on a tiny island off the northeast coast of St. Joseph Island. Accessible only by boat. Site and tower closed. Owner/site manager: Canadian Coast Guard. ARLHS CAN-528; CCG 1054. 1905. Active; focal plane 21 m (69 ft); continuous red light visible only on the range line. 8 m (27 ft) square pyramidal wood tower with lantern and gallery, painted white with red trim and a red vertical stripe on the range line. The range guides "downbound" (eastbound or southbound) vessels to a very narrow passage between the mainland and Wilson Island. Bash has a good photo, Schultheiss has Dave Wobser's photo showing both towers, and Google has a satellite view. Located beyond the end of Range Lights Road on the north side of the channel east of the ON 548 bridge to St. Joseph Island. Land access blocked by private property. Site and tower closed. Owner/site manager: Canadian Coast Guard. ARLHS CAN-599; CCG 1055. 1905. Active; focal plane 35.5 m (117 ft); continuous red light. 9 m (29 ft) square pyramidal wood tower with lantern and gallery, painted white with red trim and a red vertical stripe on the range line. Bash has a photo, Schultheiss has a photo by Dave Wobser showing both towers, and Google has a satellite view. 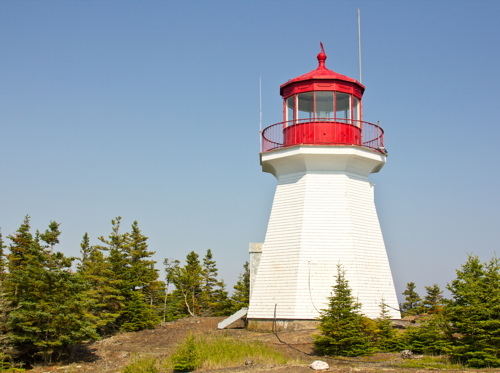 Located 220 m (240 yd) northeast of the front light, beyond the end of Range Lights Road on the north side of the channel east of the ON 548 bridge to St. Joseph Island. Land access blocked by private property. Site and tower closed. Owner/site manager: Canadian Coast Guard. ARLHS CAN-600; CCG 1056. 2009 (station establishment date unknown). Active; focal plane 8.5 m (28 ft); green flash every 5 s. Approx. 7.5 m (25 ft) square pyramidal tower with lantern and gallery. Lighthouse painted white, lantern and gallery rail red. A photo is at right, Anurag Talati has a 2018 photo, and Google has a street view and a satellite view. The original light was mounted on the roof of a warehouse on the town wharf; this was replaced in 1940 by a light on a 7 m (23 ft) post. In 2004 retired judge Ray Stortini started a campaign to replace the beacon with a lighthouse; Judge Stortini also contibuted the funds to construct the building. The lighthouse was activated in a ceremony on 30 May 2009. Located on the wharf at Richards Landing. Site open, tower closed. CCG 1057. 1909 (station established 1884). Active; focal plane 11 m (36 ft); white flash every 4 s. 10.5 m (34 ft) square cylindrical wood tower with lantern and gallery centered on the roof of 2-story wood keeper's house. Lighthouse painted white with red trim. C.M. Hanchey's photo is at right, Lighthouse Digest has Michel Forand's photo, Schultheiss has a page by Dave Wobser, Bryan O'Toole has a nice photo, and Google has a satellite view. 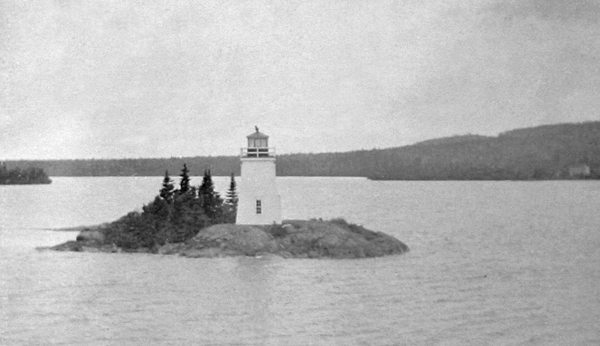 The original lighthouse burned in 1909. The current lighthouse is endangered. The Coast Guard declared the building surplus in 2008, with the intention of replacing it with a skeletal tower. The St. Joseph Township Council has expressed its willingness to take ownership of the lighthouse if the Coast Guard will make some needed repairs. Negotiations are continuing. The lighthouse was still active in the summer of 2017, although Schultheiss describes it as inactive. Located on a small island just off the northwest coast of St. Joseph Island; visible from the end of B Line Road near Richards Landing. Accessible only by boat. Site and tower closed. Owner/site manager: Canadian Coast Guard. ARLHS CAN-588; CCG 1058. Note: The St. Marys River drains Lake Superior into Lake Huron, falling 7 m (23 ft) over its length of 120 km (75 mi). The Soo Locks at Sault Sainte Marie manage this elevation difference for vessels. Below Sault Sainte Marie the river flows through Lakes Nicolet and Munuscong, passing Sugar Island on the east side of Lake Nicolet, Neebish Island between the two lakes, and St. Joseph Island on the east side of Lake Munuscong. The river forms part of the boundary between Canada and the United States; the boundary runs around the east side of Sugar Island and Neebish Island and the west side of St. Joseph Island. The Algoma Sailing Club has a map of the river. 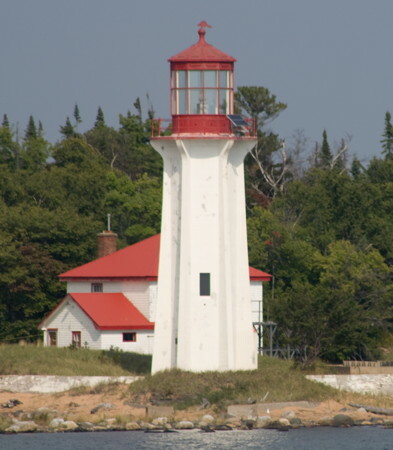 Lighthouses on the U.S. side are described on the Eastern Upper Michigan page. Date unknown. Active; focal plane 14 m (46 ft); continuous white light. 12 m (39 ft) round cylindrical tower, painted white with an orange vertical stripe. No photo available, but Google has a satellite view. This range guides downbound vessels in the St. Marys River through the Munuscong Lake section of the river. Located at Hay Point near the southern end of St. Joseph Island. Probably accessible only by boat. Site open, tower closed. USCG 7-12995; CCG 1059.6. Date unknown. Active; focal plane 22.5 m (74 ft); continuous white light. 21 m (69 ft) square skeletal tower carrying a daymark colored white with an orange vertical stripe. No photo available, but Google has a satellite view. Located 330 m (1000 ft) southeast of the front light. Probably accessible only by boat. Site open, tower closed. USCG 7-13000; CCG 1059.7. Date unknown. Active; focal plane 16.5 m (54 ft); continuous white light. 14 m (46 ft) square skeletal tower carrying a daymark colored white with an orange vertical stripe. Google has a satellite view and a distant street view. This range guides downbound vessels. The front light is on a mast. Located off ON 548 a short distance south of the Sailors' Encampment Church (next entry). Site open, tower closed. USCG 7-13140; CCG 1063. Date unknown (station established 1892). Active; focal plane 19.5 m (64 ft); continuous white light. 12.5 m (41 ft) round cylindrical tower, painted white and carrying a trapezoidal daymark painted white with a red vertical stripe. Tess Parker's photo is at right, and Google has a street view and a satellite view. This range guides northbound (upbound) vessels in the narrow passage between St. Joseph Island and Neebish Island. The original lighthouse, a square wood tower, was replaced by a skeletal tower in 1959. Located beside ON 548 in front of the historic Sailor's Encampment Church on the northwest side of St. Joseph Island. Site open, tower closed. ARLHS CAN-820; USCG 7-13100; CCG 1060. Date unknown (1959? station established 1892). Active; focal plane 35 m (115 ft); continuous white light. square skeletal tower carrying a daymark colored white with an orange vertical stripe. No photo available, but Google has a satellite view and a street view through trees. The original lighthouse, a square wood tower, was replaced by a skeletal tower in 1959. Located 672 m (2200 ft) northeast of the front light. Site and tower closed (private property). ARLHS CAN-821; USCG 7-13105; CCG 1061. Date unknown (station established 1902). Active; focal plane 15 m (49 ft); continuous white light. 16 m (52 ft) round cylindrical tower, painted white. The tower is listed with an orange vertical stripe. Google has a satellite view. This range is called an upbound range in both the Canadian and U.S. light lists, but actually it guides downbound vessels in the St. Marys River around the northern end of Neebish Island. The original lighthouse, a square wood tower, was replaced by a skeletal tower in the 1950s. Located at the northwestern point of St. Joseph Island. Probably accessible only by boat. Site open, tower closed. ARLHS CAN-825; USCG 7-13260; CCG 1064. Date unknown (station established 1902). Active; focal plane 26 m (85 ft); continuous white light. 12 m (39 ft) round cylindrical tower, painted white. No photo available, but Google has a satellite view. The new light was required by a small realignment of the range line. Located 957 m (0.6 mi) east southeast of the front light. Site status unknown. ARLHS CAN-824; USCG 7-13265; CCG 1065. Date unknown (1950s? station established 1902). Inactive. 30 m (98 ft) square skeletal tower. Google has a satellite view. Located about 75 m (250 ft) north of the new rear light. Site status unknown. Date unknown. Active; focal plane 19 m (62 ft); continuous red light. 17 m (56 ft) square cylindrical skeletal tower carrying a red slatted daymark with a white vertical stripe. No photo available, but Google has a satellite view. The Canadian Sault Sainte Marie Canal, completed in 1895, is now a national historic site; the lock is in operation but it serves only small craft. Located in the Algoma Steel Plant, on the north side of the river west of the canal entrance. Site and tower closed. Site manager: Essar Steel Algoma. CCG 1071. 1903. Active; focal plane 9 m (30 ft); continuous green light. 8.5 m (28 ft) square pyramidal wood tower, painted white with red trim and a red vertical stripe on the range line. Bash has a 2011 photo (also seen at right), Schultheiss has a page for the range lights, and Google has a satellite view and a distant street view. This is an "upbound" (westbound) range guiding ships around a sharp bend in the river above the Soo Locks. Pointe aux Pins is now known as Pointe Louise. Located on the point, at the end of Pointe Louise Road on the west side of Sault Sainte Marie. Site closed (surrounded by private property), tower closed. Soo Locks Boat Tours has a lighthouse cruise that provides a view of this lighthouse. Owner/site manager: Canadian Coast Guard. ARLHS CAN-889; USCG 7-14325; CCG 1077. 1903. Inactive since about 1975. 17 m (56 ft) square pyramidal wood tower with lantern and gallery, painted white with red trim, attached to a 1-story wood residence. Schultheiss has a page for the range lights, Dave Wobser has a great photo, and Google has a satellite view. After deactivation the lighthouse was sold, relocated to private property near its original location, and attached to a residence. The original keeper's house was destroyed. Located near the end of Point Louise Road on the west side of Sault Sainte Marie. Site closed (surrounded by private property), tower closed. Soo Locks Boat Tours has a lighthouse cruise that provides a view of this lighthouse. Owner/site manager: private. ARLHS CAN-890. 2010 (station established 1903). Active; focal plane 19 m (62 ft); continuous green light. 17 m (55 ft) slender triangular steel skeletal tower. The tower carries a trapezoidal slatted daymark painted white with a red vertical stripe. Bash has a photo, and Google has a satellite view. Dave Wobser has a photo showing the front light and the second rear light, a tripod tower. Located 280 m (980 ft) southwest of the front light, on the tip of a small peninsula at the end of Harriet Street. Site status unknown. USCG 7-14330; CCG 1078. 1970 (station established 1873). Active; focal plane 8 m (26 ft); red light, 2 s on, 2 s off. 7 m (23 ft) round cylindrical Claymar tower painted red with a white horizontal band. Anderson has Craig Hanchey's photo, and Google has a satellite view. The original lighthouse, a square wood tower, was replaced in 1970. It is possible this is the lighthouse that was displayed on Topsail Island in Bellevue Park, Sault Sainte Marie, until about 1990 (see note below under Lost Lighthouses). Site and tower closed (private property). ARLHS CAN-888; USCG 7-14370; CCG 1079. 1953 (lightship station established 1923). 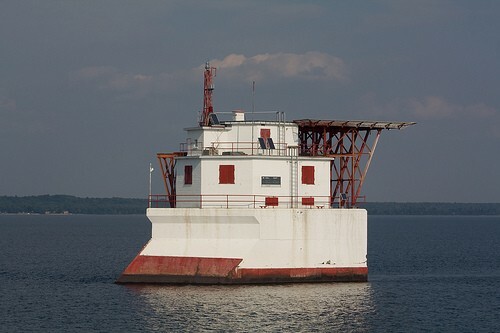 Active; focal plane 18 m (59 ft); red flash every 5 s. 18 m (60 ft) structure: the light is displayed from a skeletal mast mounted on the roof of a 3-story keeper's quarters. Lighthouse painted white with red trim. The lighthouse also carries a helipad and a tall triangular radio mast. Bash's photo is at right, Dan Cravotta has a closeup photo, Rob Fekete has a distant view, and Marinas.com has aerial photos, but the light is only a blur in Google's satellite view. The lighthouse is mounted on a concrete crib that has a knife-edge similar to a ship's prow pointed northwest; this design splits ice floes in the winter. Located on the southwest edge of the reef guarding the entrance to the river from Lake Superior. Accessible only by boat; Soo Locks Boat Tours has a lighthouse cruise that provides a view of this lighthouse, and there is a distant view from the Point Iroquois lighthouse in the U.S., 4 km (2.5 mi) to the south. Owner/site manager: Canadian Coast Guard. ARLHS CAN-565; USCG 7-14495; CCG 1081. 1912. Active; focal plane 16 m (53 ft); white flash every 10 s. 9 m (30 ft) hexagonal concrete tower with lantern and gallery, painted white; lantern is red. The two keeper's houses are staffed in season as the initial contact for eastbound vessels entering the Soo Traffic Control Area. Bash's photo is at right, Schultheiss has a page with several photos, Wikimedia has a view from the lake, Marinas.com has aerial photos, and Google has a satellite view of the station. Île Parisienne is an uninhabited 900 ha (2200 acre) island in Whitefish Bay southeast of Whitefish Point, Michigan, and northwest of the entrance to the St. Marys River. Most of the island is wilderness included in the Île Parisienne Conservation Reserve; a 46 ha (114 acre) tract at the southeast corner is privately owned. Lighthouse located at the southwest corner of the island. Accessible only by boat. Site and tower closed. Owner/site manager: Canadian Coast Guard. ARLHS CAN-567; USCG 7-14510; CCG 1082. 1931 (station established 1873). Inactive since 1961. Square cylindrical wood tower mounted on the roof of 2-story wood keeper's quarters. Google has a satellite view. The original lighthouse was replaced after being struck by lightning in the fall of 1930. In 1967 the light station property was ceded to the original landowners, the Batchewana First Nation of Ojibways; they administer it as the Obadjiwan 15E Reserve. The lighthouse was then designated as the residence of the hereditary chief, currently Joe Tom Sayers. Located on a prominent cape at the west side of the entrance to Batchawana Bay, about 3 km (2 mi) southwest of the town of Batchawana Bay. Accessible by road. Site open, tower closed. Owner/site manager: Batchewana First Nation. ARLHS CAN-1028. 1910. Inactive since the 1960s. Approx. 9 m (30 ft) square pyramidal frame tower with lantern and gallery, painted white with red trim; lantern and gallery are red. Bash has a photo, Earl Minnis has a winter photo, Michele Maki also has a photo, and Google has a street view and a satellite view. Endangered. Originally located on the cape, about 20 km (13 mi) northwest of Batchawana Bay; it was replaced there by a small post light (CCG 1087). 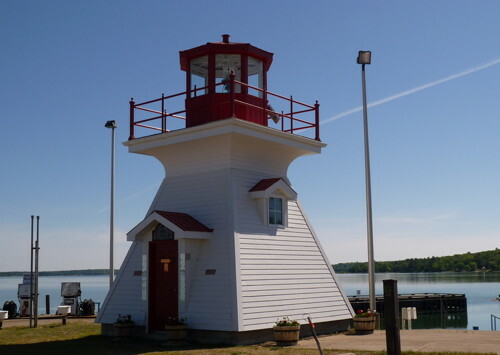 After deactivation, the lighthouse was sold and relocated to a restaurant and campground at Hibbard Bay, about 3 km (2 mi) to the north. These businesses are now closed but the lighthouse still stands beside the Trans-Canada Highway (ON 17) about 85 km (53 mi) north of Sault Sainte Marie. Site open, tower closed. Owner/site manager: unknown. ARLHS CAN-147. 1980 (station established 1889). Active; focal plane 24 m (79 ft); white flash every 4 s. 5 m (17 ft) mast carrying a red and white daymark. No photo available, but Bing has a distant satellite view. Gargantua is a former logging and fishing harbor on the central east coast of Lake Superior. The village has been abandoned at least since the 1960s. The original lighthouse, a hexagonal wood tower, was replaced by a skeletal tower in 1949 and then by the mast in 1980. Located on the summit of the island, in the entrance to the harbor. Accessible only by boat. Site open, tower closed. Site manager: Lake Superior Provincial Park. ARLHS CAN-1066; CCG 1091. 1967 (station established 1902). Active; focal plane 27 m (89 ft); white flash every 10 s. 12.5 m (41 ft) square pyramidal steel skeletal tower. Several Coast Guard station buildings. Fog horn (two 3 s blasts every 60s) on request. A closeup snapshot is available, and Google has an indistinct satellite view. The original lighthouse, a square wood tower, was demolished after being deactivated. 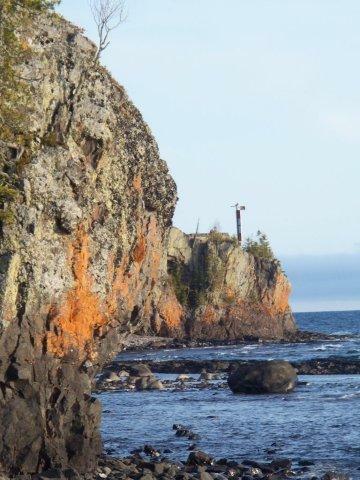 Located on Perkwakwia Point about 10 km (6 mi) west of Michipicoten and 25 km (15 mi) west of Wawa, at the extreme northeastern corner of Lake Superior. Site status unknown. Owner/site manager: Canadian Coast Guard. ARLHS CAN-1318; USCG 7-16855; CCG 1093. 1912 (station established 1886). Active; focal plane 30 m (99 ft); white flash every 15 s. 31.5 m (104 ft) hexagonal concrete tower with six flying buttresses, lantern and gallery. Lighthouse painted white; lantern, gallery, and watch room are red. All other structures demolished. 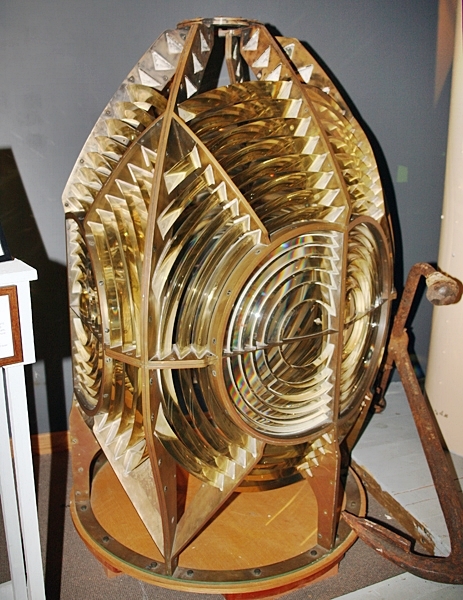 The original 2nd order Fresnel lens is displayed at the Coast Guard Base in Parry Sound. Bob Mackie's photo is at right, Laurie Mackie has a 2011 closeup, and Google has a satellite view. Marinas.com has aerial photos, but they show the station before the houses and other buildings were removed. Lighthouse Digest has a historic view of the station from the lake. Caribou Island is about 55 km (35 mi) off Agawa Bay on the east shore of the lake. The island is owned as a nature reserve by the Melon Conservancy Trust. The lighthouse is located on a small island southwest of Caribou Island itself and about 5 km (3 mi) north of the international border. Accessible only by boat. Site open, tower closed. Owner/site manager: Canadian Coast Guard. ARLHS CAN-631; USCG 7-16845; CCG 1096. 1912. Active; focal plane 25.5 m (84 ft); white flash every 10 s. 21.5 m (71 ft) hexagonal concrete tower with six flying buttresses, lantern and gallery. Lighthouse painted white; lantern, gallery, and watch room are red. 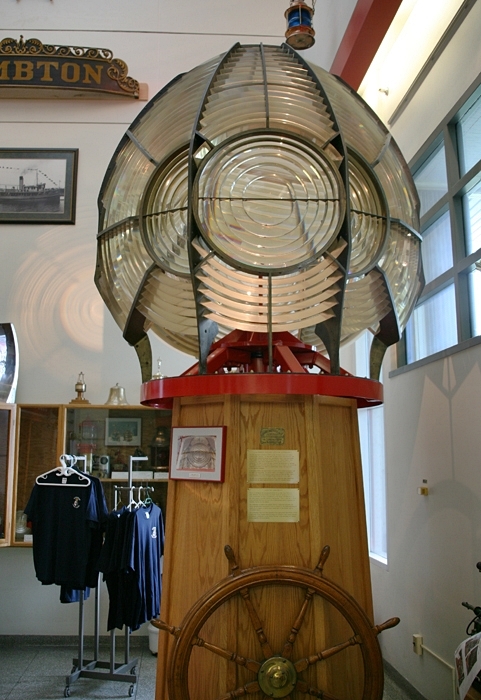 The original 3rd order Fresnel lens is displayed at the Coast Guard Base in Parry Sound. J. Rowe Heritage Consulting has a page with a photo and the history of the station, Lighthouse Digest has a photo by Ken Szijarto, Marinas.com has aerial photos, and Google has a satellite view. Michipicoten Island is a large (500 km2 or 200 sq. mi.) wilderness island 15 km (10 mi) south of the north shore of the lake and 65 km (40 mi) southwest of Wawa. The entire island is a provincial park. Tours by sea kayak are available. Lighthouse located at the eastern end of the island. Accessible only by boat. Site open, tower closed. Owner: Canadian Coast Guard. Site manager: Michipicoten Island Provincial Park. ARLHS CAN-1319; CCG 1097. 1911 (station established 1872). Active; focal plane 39 m (129 ft); white flash every 20 s. 13 m (44 ft) octagonal concrete tower with lantern and gallery, painted white with red trim; lantern is red. User-activated fog horn (two 3 s blasts every 60 s). Lighthouse Digest has a photo by Ken Szijarto, Marinas.com has aerial photos, and Google has a distant satellite view. Located on the summit of a small island, part of a reef sheltering Québec Harbour on the south side of Michipicoten Island. Accessible only by boat. Site open, tower closed. Owner: Canadian Coast Guard. Site manager: Michipicoten Island Provincial Park. ARLHS CAN-559; CCG 1098. Date unknown (station established 1918). Active; focal plane 6.5 m (21 ft); continuous red light. 5 m (17 ft) square skeletal mast carrying a daymark colored white with an orange vertical stripe. No photo available, but Google has a satellite view. Anderson discusses these range lights on his Davieaux Island page. The original lighthouse, a 10 m (32 ft) square tower, was built on Agate Island in 1872 and relocated as the front range light in 1917. Located on the north side of the harbor, the only sheltered harbor on Michipicoten Island. Accessible only by boat. Site open, tower closed. Owner: Canadian Coast Guard. Site manager: Michipicoten Island Provincial Park. ARLHS CAN-853; CCG 1099. Date unknown (station established 1918). Active; focal plane 20 m (66 ft); continuous red light. 5 m (17 ft) square skeletal mast carrying a daymark colored white with an orange vertical stripe. No photo available, but Google has a satellite view. 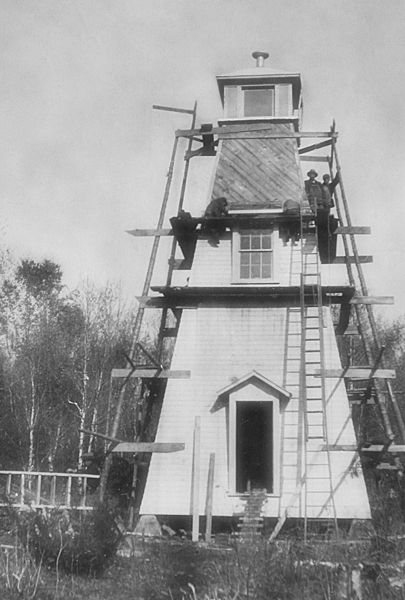 Anderson discusses these range lights on his Davieaux Island page; he has a photo of the original lighthouse under construction. Located 214 m (702 ft) north of the front light. Accessible only by boat. Site open, tower closed. Owner: Canadian Coast Guard. Site manager: Michipicoten Island Provincial Park. ARLHS CAN-854; CCG 1100. 1903. Active; focal plane 29.5 m (97 ft); white flash every 8 s. 6.5 m (21 ft) octagonal pyramidal concrete tower with lantern and gallery, painted white; lantern is red. Lighthouse Digest has a photo by Wende Cameron Botham, Marinas.com has aerial photos, and Google has a satellite view. Located on a small island off the most remote section of the lakeshore. Accessible only by boat; tours by sea kayak available. Site open, tower closed. Owner: Canadian Coast Guard. Site manager: Pukaskwa National Park. ARLHS CAN-582; CCG 1102. 1975 (station established 1891). Active; focal plane 27 m (89 ft); white flash every 4 s. 13 m (43 ft) square steel skeletal tower. A distant view is available, and Google has an indistinct satellite view of the station. 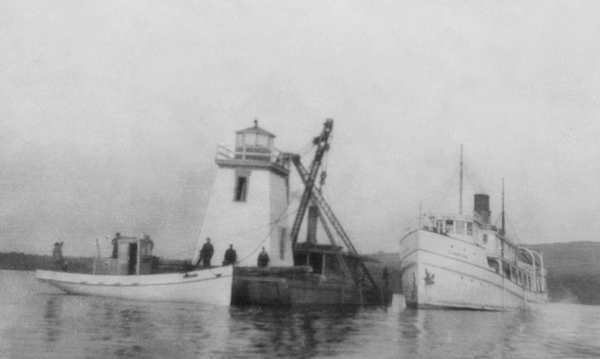 The original lighthouse was replaced in 1929 by the lighthouse shown in the photo contributed to Lighthouse Digest by Michel Forand. The 1929 lighthouse was destroyed after being deactivated in 1957. The island is named for an early keeper, David Hawkins. Located at the southwestern tip of the island, at the entrance to Peninsula Harbour at Marathon. Accessible only by boat. Site open, tower closed. Owner/site manager: Canadian Coast Guard. ARLHS CAN-1081; CCG 1106. 1902. Active; focal plane 68 m (224 ft); white light, 10 s on, 5 s off. 7 m (22 ft) octagonal wood tower with lantern and gallery, painted white; lantern and gallery painted red. Two 2-story keeper's houses and other light station buildings located on the shore below the lighthouse. A photo by Bluebird Charters is at right, Lighthouse Digest has Aaron White's photo, Marinas.com has aerial photos, and Bing has a satellite view. The Slate Islands, located about 11 km (7 mi) southeast of Terrace Bay, are included in a provincial park. Lighthouse located on a high ridge on the south side of Patterson Island. Accessible only by boat; transportation from Terrace Bay or Rossport can be arranged and tours by sea kayak are available. Site open, tower closed. Owner: Canadian Coast Guard. Site manager: Slate Islands Provincial Park. ARLHS CAN-589; USCG 7-16865; CCG 1111. 1911 (station established 1877). Active; focal plane 36 m (118 ft); three white flashes, separated by 4 s, every 24 s. 13 m (43 ft) round concrete tower with lantern and gallery, painted white; lantern and gallery painted red. Keeper's house occupied by a resident caretaker, who is the former keeper. Schultheiss has a closeup photo by Lisa Bryson, R.L. Cook has a good photo (last photo on the page), Lighthouse Digest has a Coast Guard aerial photo, Marinas.com has aerial photos, and Google has a satellite view of the station. Located at the western end of the island, south of Rossport. Accessible only by boat. Site open, tower closed. Owner/site manager: Canadian Coast Guard. ARLHS CAN-547; USCG 7-16870; CCG 1117. 1961 (station established 1877). Active; focal plane 30 m (99 ft); white flash every 5 s. 12 m (40 ft) square pyramidal steel skeletal tower. 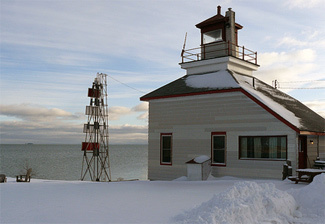 The 2-story wood keeper's house and several other buildings remain of the original light station. Google has a satellite view. 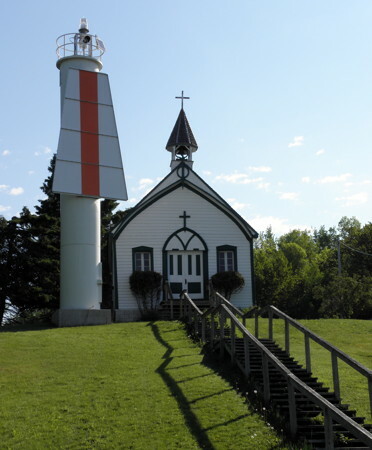 In June 2015 it was reported that the lighthouse will receive Heritage designation. Located on a small island off the western entrance to Nipigon Bay. Accessible only by boat. Site open, tower closed. Owner/site manager: Canadian Coast Guard. ARLHS CAN-757; CCG 1126. 1910. 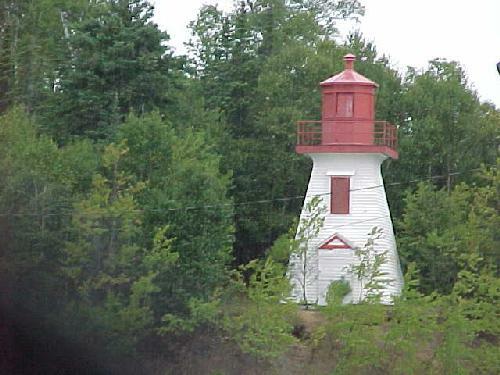 Active; focal plane 11 m (36 ft); white flash every 4 s. 7.5 m (24 ft) square pyramidal wood tower with lantern and gallery, painted white with red trim; lantern and gallery are red. R.L. Cook has several excellent photos (1/3 to 1/2 the way down the page), and Google has a satellite view. 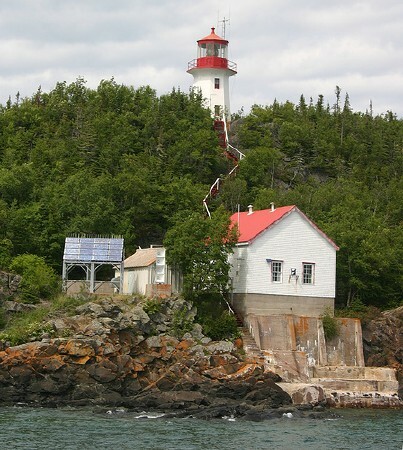 In 2014 a new group, Canadian Lighthouses of Lake Superior, assumed management and restored the lighthouse; they repainted the lighthouse in 2014 and there are plans to make it available for overnight accommodations for boaters and kayakers. Located on a small island east of Edward Island and about 25 km (15 mi) northeast of the village of Silver Islet. Accessible only by boat. Site open, tower closed. Owner: Canadian Coast Guard. Site manager: Canadian Lighthouses of Lake Superior. ARLHS CAN-587; CCG 1127. 1960 (station established 1873). Active; focal plane 25 m (82 ft); white flash every 10 s. 14.5 m (48 ft) square pyramidal skeletal tower with square central cylinder, lantern and gallery, painted white. 2-story keeper's quarters and other light station buildings. Bash's photo is at right, R. L. Cook has posted several good closeup photos (top of the page), Marinas.com has aerial photos, and Google has a satellite view of the station. In 2014 a new group, Canadian Lighthouses of Lake Superior, assumed management and restored the lighthouse; they repainted the lighthouse in 2014 and there are plans to make it available for overnight accommodations for boaters and kayakers. In 2016 CLLS was seeking college students to take residence at the light station for the summer. Porphyry Island is a provincial nature reserve and a popular destination for sea kayakers. Located at the southwestern tip of the island guarding the entrance into Black Bay, about 8 km (5 mi) east of Silver Islet. Accessible only by boat. Site open, tower closed. Owner: Canadian Coast Guard. 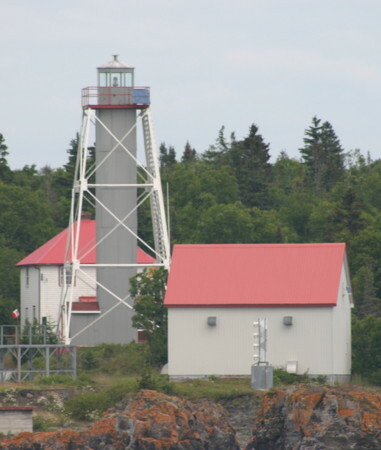 Site manager: Canadian Lighthouses of Lake Superior and Porphyry Island Provincial Park. ARLHS CAN-584; USCG 7-16885; CCG 1128. 1910. 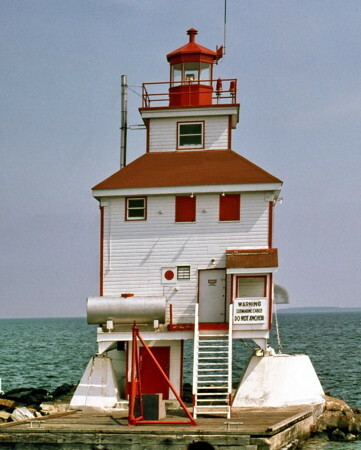 Active; focal plane 35 m (114 ft); white flash every 5 s. 7 m (23 ft) octagonal concrete tower with lantern and gallery, painted white with red trim; lantern and gallery painted red. 3rd order Fresnel lens. 2-story keeper's quarters and other light station buildings. Bash's photo appears at the top of this page, Marinas.com has aerial photos, and Google has a satellite view. 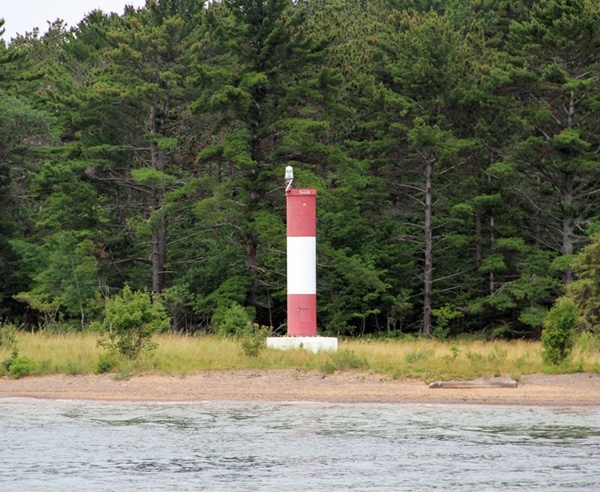 The Friends of Trowbridge Island Lighthouse was formed to work for the preservation of the light station, but the station is now leased by Canadian Lighthouses of Lake Superior. In 2018 CLLS received a $25,000 grant for a general cleanup of the light station. Located atop a small island east of Thunder Cape on the approach to Thunder Bay. Accessible only by boat. Site open, tower closed. Owner: Canadian Coast Guard. Site manager: Canadian Lighthouses of Lake Superior. ARLHS CAN-596; USCG 7-16890; CCG 1129. Date unknown (station established 1874). Active; focal plane 10.5 m (35 ft); white flash every 4 s. 6.5 m (21 ft) mast carrying a rectangular red and white daymark. A photo is available, Google has a satellite view. Several station buildings survive; they are now occupied by the Thunder Cape Bird Observatory. Lighthouse Digest has a historic distant view of the station. The original lighthouse was demolished in the 1920s after being replaced by a post light. Located on the tip of a long, narrow peninsula sheltering the east side of Thunder Bay. Site open, tower closed. Owner: Canadian Coast Guard. Site manager: Sleeping Giant Provincial Park. ARLHS CAN-1086; USCG 7-16905; CCG 1131. Date unknown (station established 1927). Active; focal plane 24.5 m (81 ft); white flash every 20 s. Approx. 21 m (70 ft) square pyramidal steel skeletal tower. The 1-1/2 story keeper's house and several other buildings remain of the original light station. Schultheiss has a page for the lighthouse, and Google has a satellite view of the station. The Trowbridge Island and Angus Island lights frame the entrance to Thunder Bay. Located on a small island off the east end of Pie Island on the south side of the entrance. Accessible only by boat. Site open, tower closed. Owner/site manager: Canadian Coast Guard. ARLHS CAN-1026; USCG 7-16895; CCG 1130. Date unknown. Active; focal plane 9.5 m (31 ft); green flash every 4 s. 6 m (20 ft) post mounted on a 1-story equipment building, painted white. No photo available, but Google has a satellite view. Located at the end of the breakwater on the south side of the north entrance to Thunder Bay Harbour. Accessible only by boat. Site and tower closed. Owner/site manager: Canadian Coast Guard. CCG 1156. 1937. Active; focal plane 15 m (49 ft); red flash every 5 s. 9.5 m (31 ft) square cylindrical wood light tower with lantern and gallery, centered on the roof of a 2-story wood keeper's house. Lighthouse painted white with red trim, lantern red. User-activated fog horn (three 2 s blasts every 60 s). Bob Kissel's photo is at right, Marinas.com has aerial photos, and Google has a satellite view. In 2013 the Friends of Trowbridge Island Lighthouse expanded its efforts to work for preservation of this lighthouse as well. Located at the end of the north breakwater sheltering the city's main harbor. Accessibility and site status unknown, but the lighthouse can be seen easily from the downtown waterfront. Tower closed. Owner/site manager: Canadian Coast Guard. ARLHS CAN-595; USCG 7-16915; CCG 1152. Date unknown. Active; focal plane 8 m (26 ft); green flash every 5 s. 6 m (20 ft) post mounted on a 1-story equipment building, painted white. No photo available, but Google has a satellite view. Located at the end of the breakwater on the south side of the south entrance to Thunder Bay Harbour. Accessible only by boat. Site and tower closed. Owner/site manager: Canadian Coast Guard. CCG 1150.3. Date unknown. Active; focal plane 6.5 m (22 ft); red flash every 10 s. 5 m (17 ft) post mounted on a 1-story equipment building, painted white. No photo available, but Google has a satellite view. This light is probably similar to the Mission Channel Entrance Light (see below). Located at the south end of the Thundar Bay breakwaters, marking the entrance to the river. Accessible only by boat. Site and tower closed. Owner/site manager: Canadian Coast Guard. CCG 1144. 1959 (station established 1906). Active; focal plane unknown; white flash every 10 s. Approx. 20 m (66 ft) square skeletal tower, painted red. 1-story modern keeper's house (1959) and other station buildings. Google has a satellite view. Located on the northeastern point of the island, about 8 km (5 mi) southeast of the Thunder Bay waterfront. Accessible only by boat. Site status unknown. ARLHS CAN-521; CCG 1133. 1917. Active; focal plane 13.5 m (44 ft); green flash every 2 s. 7.5 m (25 ft) square 1-story workroom topped by a square skeletal tower. Skeletal tower is green; workroom painted white with red trim and red gallery on the roof. Google has a satellite view. Located at an elbow of the breakwater at the entrance to Mission River, on the south side of Thunder Bay. Accessible only by boat. Site and tower closed. Owner/site manager: Canadian Coast Guard. ARLHS CAN-1016; CCG 1136. 1904 (station established 1895). Inactive since 1953. Approx. 9 m (30 ft) square pyramidal wood tower with lantern, painted white with red trim. Trees conceal the lighthouse in Google's satellite view. The original (1895) lighthouse was sold and dismantled for its lumber. The current light (focal plane 10 m (33 ft); white flash every 4 s) is on a 5 m (17 ft) skeletal tower. Pie Island is an island about 12 km (7.5 mi) long, located about 10 km (6 mi) south of Thunder Bay and 25 km (15 mi) north of Isle Royale, Michigan. Located at the west end of the island. Accessible only by boat. Site open, tower closed. ARLHS CAN-792; CCG 1158. 1980s (station established 1887). Active; focal plane 18 m (59 ft); white flash every 4 s. Approx. 12 m (39 ft) square pyramidal skeletal tower carrying two rectangular red and white daymarks. No photo available, but Google has a satellite view. The original lighthouse was a square pyramidal wood tower. Located on the western tip of the island, about 16 km (10 mi) northeast of the U.S. border. Accessible only by boat. Owner/site manager: Canadian Coast Guard. ARLHS CAN-859; CCG 1161. 2003. Active (privately maintained and unofficial); focal plane about 12 m (39 ft); continuous (?) white light. Approx. 9 m (30 ft) square pyramidal wood tower with lantern and gallery. Lighthouse covered with unpainted wood shingles. A photo is at right, the township has a page for the lighthouse, a 2016 photo and a 2004 photo are available, and Google has a satellite view. Built as a civic project by volunteers, guided by plans supplied by the Coast Guard. The Rainy River drains westward into the Lake of the Woods, forming part of the boundary between Canada and the U.S. Located on the bank of the Rainy River off ON 11 in Barwick, about 80 km (50 mi) west of Fort Frances. Site open, tower closed. Owner/site manager: Chapple Township. 1901. Inactive since 1963. 10 m (33 ft) square pyramidal wood tower with lantern and gallery, painted white with red trim; lantern roof is red. Bing has a distant satellite view. Originally located on a small island southeast of Bigsby Island in the Lake of the Woods, this lighthouse was sold to private owners in 1963. The lighthouse was relocated to Morson, on the northeastern extension of the lake off ON 11, where it houses a collection of artifacts of early travel on the lake. The lighthouse was replaced at its original location by a post light (focal plane 10 m (33 ft); green flash every 4 s; CCG 1500). Bing also has a satellite view of the original location. Located at the end of Lighthouse Road just south of Morson. Site, museum and tower open by appointment only (call ahead). Owner/site manager: private (Tomahawk Island Lighthouse). ARLHS CAN-1087. Date unknown. Active; focal plane 14 m (46 ft); white flash every 4 s. 6.5 m (21 ft) post carrying a red and white daymark. No photo available, but Google has an indistinct satellite view of the location. The original lighthouse, a square wood tower, was removed around 1960. Located on a small island off the western tip of Bigsby Island in the Lake of the Woods. Accessible only by boat. Site status unknown. ARLHS CAN-1062; CCG 1499. Agate Island (1872-1917), Michipicoten Island, Lake Superior. Anderson discusses this lighthouse on his Davieaux Island page. The lighthouse was relocated in 1917 to be the Québec Harbour Range Front Light, and there is no longer a light at this location. ARLHS CAN-1043. Bamford Island (1885-1911? ), St. Joseph Channel. Nothing remains of this lighthouse, which stood in the route of the bridge to St. Joseph Island on ON 548. Anderson discusses the lighthouse on his page for the Wilson Channel Range Front Light. ARLHS CAN-1045. Bishops Bay Range Front and Rear (1897-1962), Lake of the Woods. This range has been discontinued, and nothing remains of the lighthouses. ARLHS CAN-1048 and 1049. Kaministikia (Range Rear?) (1873-1908), Thunder Bay, Lake Superior. Anderson mentions on his Thunder Bay Main page that range lights were established at the river entrance in 1873. Scott's Great Lakes Pilot (1901) describes these range lights. It appears that nothing remains of this station. ARLHS CAN-813. Kaministikia River (Range Front?) (1873-1908), Thunder Bay, Lake Superior. ARLHS CAN-814. Michipicoten Island (Québec Harbour) (1872-1918), east side of the entrance to Québec Harbour, Lake Superior. Google's satellite view of this site appears to show foundation ruins of the lighthouse. ARLHS CAN-576. Port Arthur (1887-? ), south side of Thunder Bay, Lake Superior. This lighthouse stood on a breakwater that has been removed; Anderson mentions it on his Thunder Bay Main page. ARLHS CAN-1084. Rainy River Range Front and Rear (1886-? ), Lake of the Woods. This range has been discontinued, and nothing remains of the lighthouses. ARLHS CAN-855 and 856. Saint Ignace (Talbot Island) (1866-1873), Nipigon Bay, Lake Superior. Nothing remains of this light station. ARLHS CAN-1113. Squaw Island (1900-1980s), Lake of the Woods. ARLHS CAN-827. Topsail Island (Sault Sainte Marie). 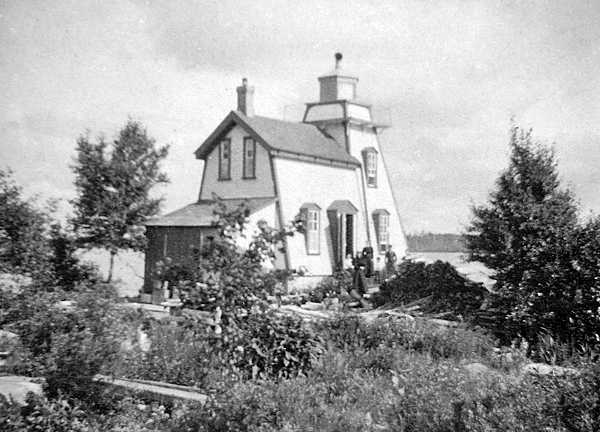 There is a photo of a lighthouse that stood on Topsail Island in Bellevue Park, Sault Sainte Marie. There is no record of a navigational light at this location, so apparently the lighthouse was relocated to the park from an unknown light station. The lighthouse was demolished (one source says it was burned by arsonists) sometime around 1990. More information on this lighthouse is needed! Spanish River, Spanish (North Channel), has a lighthouse of modern construction; it may be active, but it is not listed as an official aid to navigation. Wikimedia has a photo, and Google has a distant satellite view. Owner: Town of Spanish. Site manager: Spanish Municipal Marina. Terrace Bay has a faux lighthouse (2011) at the Simcoe Plaza shopping center; it is not an aid to navigation. Google has a street view and a satellite view. Posted December 16, 2003. Checked and revised September 1, 2017. Lighthouses: 48. Site copyright 2017 Russ Rowlett and the University of North Carolina at Chapel Hill.